In 2005, when the bankruptcy laws were reformed and “BAPCPA” was enacted, the Means Test was created to determine whether a potential debtor would qualify for a Chapter 7 discharge. Generally speaking, the Means Test takes a look at a debtor’s income to determine whether they either fall below median income or have enough disposable monthly income to afford to pay back their unsecured creditors. Although it is typically thought that those who are above median income do not qualify for a Chapter 7 bankruptcy, which is not always the case. The Means Test takes into calculation the previous six months of income and compares that to the median income of similar households in the state in which you live. Generally, all income from every source is accounted for in the Means Test (i.e. wages and regular contributions from family members). However, income derived from Social Security does not count as part of the calculation. If the potential debtor’s average six month income falls below the median income for similar households in the state, they would pass the first prong of the Means Test and qualify for a Chapter 7 discharge. Although many debtors may find themselves above median income, they may still qualify for a Chapter 7. If the debtor’s income rises above the median income, the Means Test allows deductions for certain expenses to determine the debtors monthly disposable income, or, in other words, how much money the debtor has left over at the end of the month to pay creditors. These expenses are typically based upon the IRS standards. Debtors may also deduct ongoing expenses for their secured creditors (i.e. mortgage and car payments). If the debtor does not have disposable income for the unsecured creditors after certain allowable expenses are deducted, then they probably pass the second prong of the Means Test and qualify for a Chapter 7 discharge. While most debtors must typically complete the Means Test calculations, certain debtors are exempt from the Means Test and may qualify for a Chapter 7 regardless of their income. For example, debtors who have primarily non-consumer debt do not need to complete the Means Test to qualify for a Chapter 7. 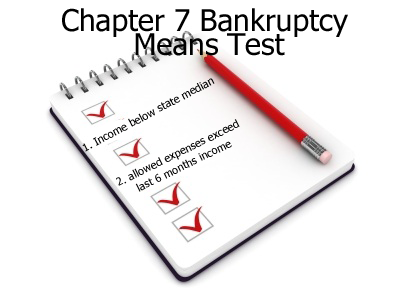 If you have questions about the Means Test or whether you qualify for a Chapter 7, consult a Bankruptcy Attorney.